I learned much from the book, but in particular after 35 years of marriage, I learned I needed to be far more intentional in devoting time each week with Deb. For the past 37 years, I have studied Deb and I do know what pleases her, excites her, honors, encourages, and refreshes her. I still have more to learn but I know much now. From that knowledge of studying and gathering information about her, I have committed myself in answering question 3 by intentionally planning each week how I can surprise her in ways to lead and love her. The key that I learned from C.J. is planning. I start each week with my date/time book (I have yet to be converted to a PDA). As part of planning for the week is a planned encounter with Deb. I am not much with creative romantic ideas but I know that Deb appreciates even the clumsy attempts. An example was this past week and my desire to as C.J. puts in the book, “to touch the heart and mind of your wife before you touch her body.” I suggested to Deb we go for a ride on our horses. Now you need to understand that this was not just a romantic gesture on my part, but was actually of the heroics of the grand stories of the Knights of the Roundtable. Deb loves to ride and the weather is not a factor to her. I’m ok with riding when the weather is good. Deb grew up on horses, I was chased by horses in New York with police in the saddle. 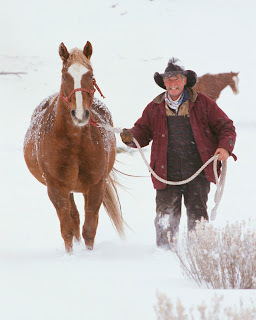 Monday was pretty cold, a front was coming in, and my horse, Dakota, had not been ridden in quite awhile and he is to put it mildly, very spunky. Ride was 5 miles on the road – I traveled at least 7 with Dakota through the extra moves of circles, swerves, spins, and a few vertical yards at times from bucking. I was freezing to death and to make the story short, I impressed my wife in incredible ways. Not only in taking the time to do this, but in my riding skills which was actually my looking like I was in control but actually was the grip of one in terror. Men, take time to study, gather data, and implement a plan of romance to your wife. Valentines Day is an expected opportunity. Why not “touch her heart and mind” each week with intentional plans of impressing her.